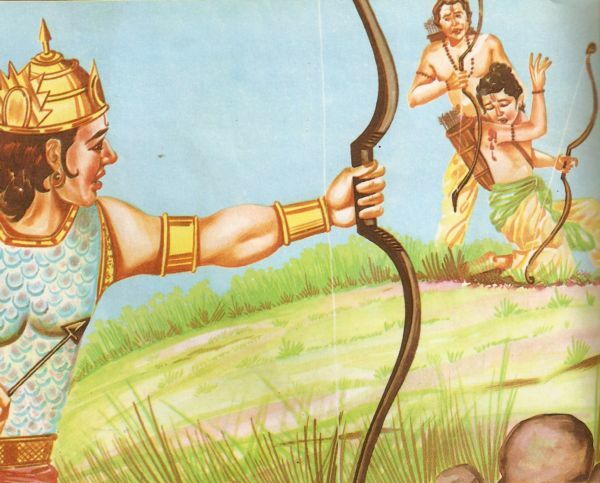 Lav’s words enraged Shatrughna and he raised his bow and arrows to chastise both the brothers. But before he could do anything, the twins showered arrows on his chariot and broke it. 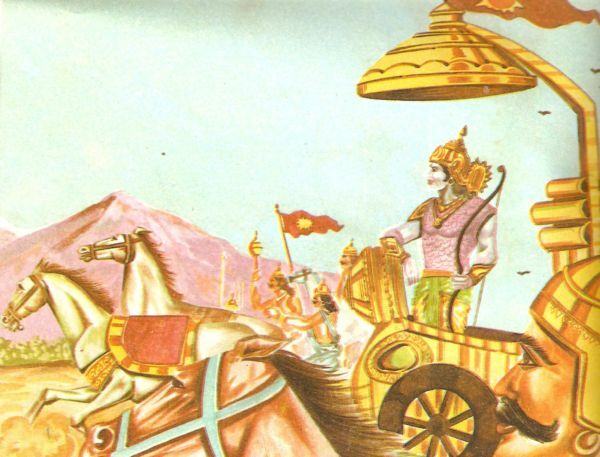 Seeing his chariot broken Shatrughna felt even more enraged and he began to shoot arrows on Lav and Kush. He ordered his soldiers to join the fight as well. But the twins kept facing them courageously. Kush replied, “Wait! I shall teach him a lesson.” Saying so, he rained volleys of arrows on Shatrughna and pierced his body. Having been badly wounded, he fell down senseless on the ground. Then they turned to other warriors and killed most of them. Those who could not face them ran away to save their lives. It will be a miracle indeed if your statement is true. We did not come across such warriors even when we had to face the demons, “replied Lakshmana amazement. “Waste no time any more, Lakshmana. Go and bring them into our presence so that we may see those brave boys,” said Rama to Lakshmana. So, seeking Ram’s permission, Lakshmana marched to the field of battle with a strong army. “A helper! It is you who will need a helper, not we; send for someone who can take you away when we have pierced your body with our arrows.” Saying so, Kush shot a fierce arrow at Lakshmana and his crown went rolling in the air to fall down at a large distance. Lakshmana’s anger knew no bounds now. So he started showering arrows at both the brothers. But they were far better archers. They shot arrows in such a manner that all the Lakshmana’s arrows were but down half way to fall on the ground in the no-mans land. The battle was so fierce that the land began to tremble and the twang of bows of arrows thundered as clouds. 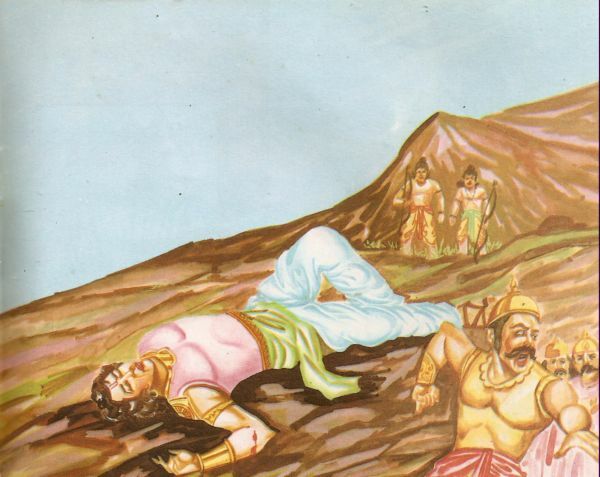 Then finding a chance, Kush gave such a hard blow to Lakshmana that he could not hold his own. Staggering violently, he felt embarrassed and accepted his defeat in his mind. 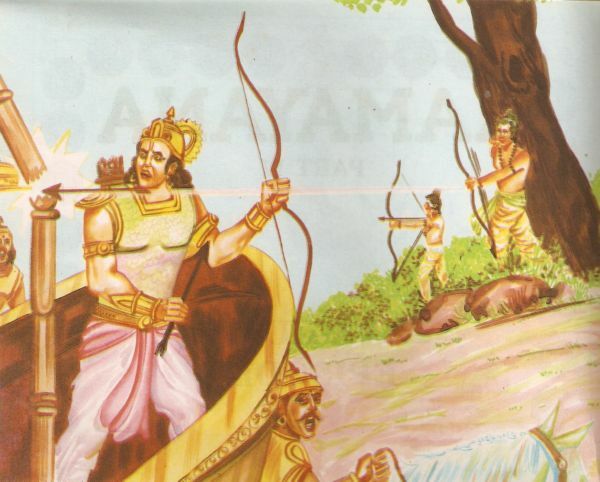 Seeing Kush all right again, Lakshmana got ready again and began to shoot dangerous arrows that he had used while fighting against Meghananda and other fierce warriors of Lanka. But Lav and Kush rendered then useless cutting them mid-way. 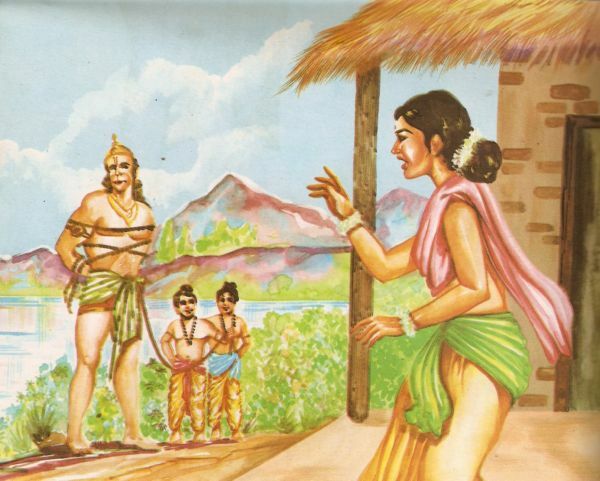 Lakshmana felt embarrassed indeed, the remark about Sita’s helplessness in the forest had done away with his courage, though apparently he looked fighting. Now Lav set on his bow the arrow that Saint Valmiki had given him after infusing supernatural effect in it through his miraculous power. Nobody in the three worlds could go unhurt when hit by this arrow. 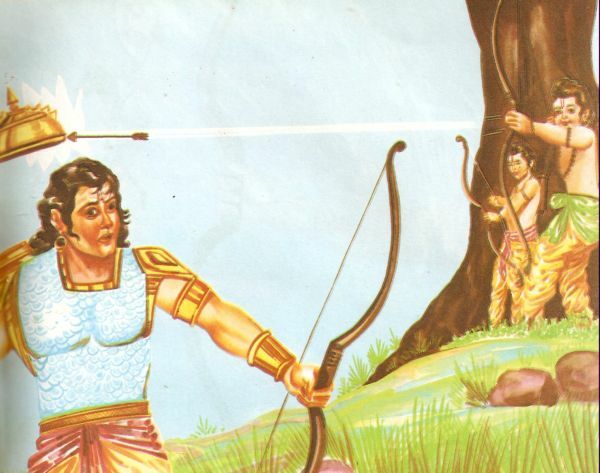 So, as soon as this arrow hit Lakshmana, he fell down senseless. Lakshmana’s defeat demoralized his army. Unable to face the arrows shot by the twin brothers, most of the soldiers fled away in fear. 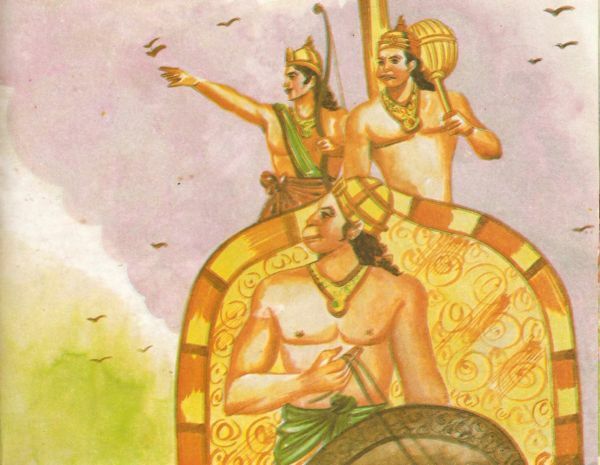 Reaching Ayodhya they informed Rama of Lakshmana’s defeat and unconsciousness. Saying so, Hanuman set about the task of collecting his army. 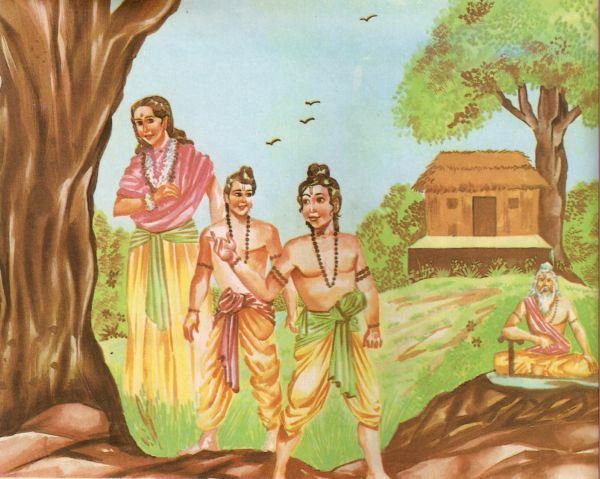 Bringing Jamvant, Sugreeva, Dwivid, Mayand and Angad too with him, he informed Bharata of their arrival. Bharata too had got ready by now. He came there and inspected the Vanara army. 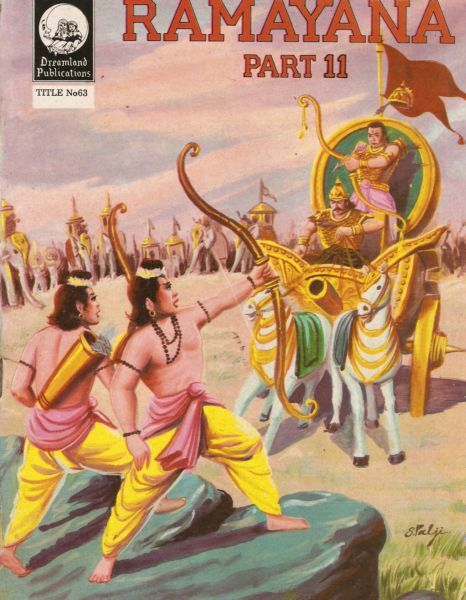 Then taking permission from Rama, he marched to the battle-field at the head of his army. “A splendid idea indeed. Let the Vanaras come face to face with us.” Saying so, both brothers got ready with their bows and arrows. 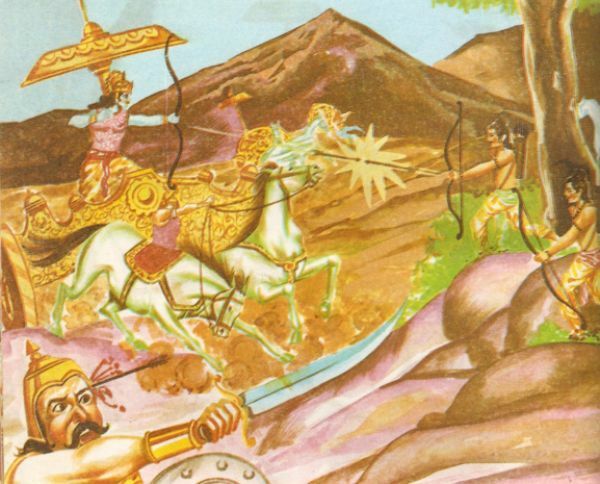 As soon as Bharata’s army set foot into the field of battle the twins began to shower arrows on his Vanara soldiers. Their arrows wounded all the chief Vanara warriors and most of them began to lick dust. 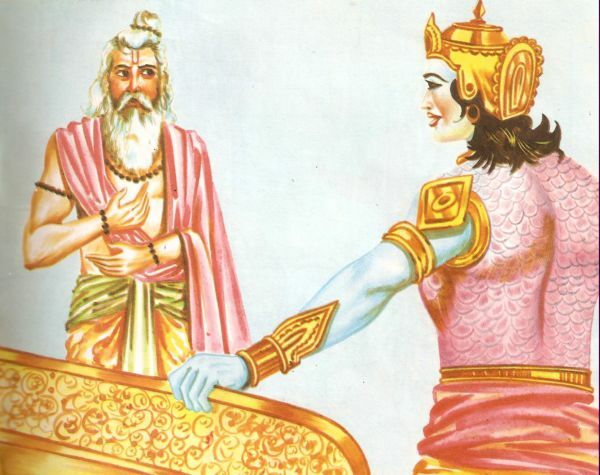 Seeing this, Bharata felt worried and he did not know what to do. 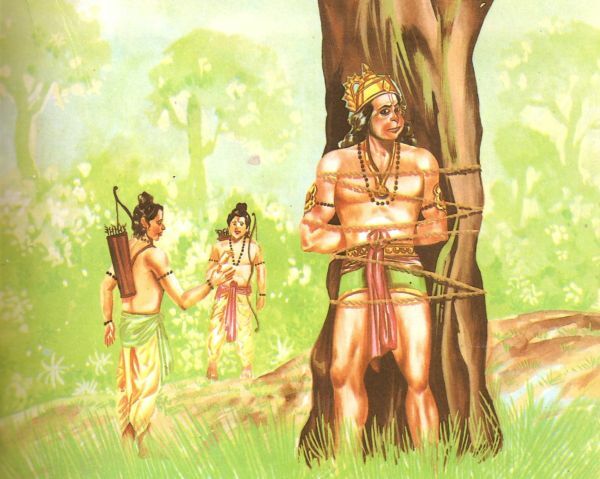 Not only this, even Hanuman was all praises for the young brothers, their skill in archery and their courage as well. Hearing Bharata’s words, Hanuman advanced forward with his mace and started fighting against Lav and Kush. But they checkmated him. All his skills in warfare could cut no ice and he felt helpless before them. Seeing this, Bharata was beside himself with anger. He shot a fierce arrow at Lave who fell down unconscious on the ground. Unable to tolerate it, Kush shot a counter arrow at Bharata. It hit him in his chest and made him senseless. Then Kush turned to his brother, Lav. He drew out the arrow from his body and nursed his wound. As a result, Lave was ready for fight again. When the news of Bharata’s unconsciousness and the defeat of Rama’s army reached Ayodhya, Ram felt awfully hurt. So, leaving the defense of the yajna to the care of his courtiers, he raised an ary. Vibhihana was also there at the time. 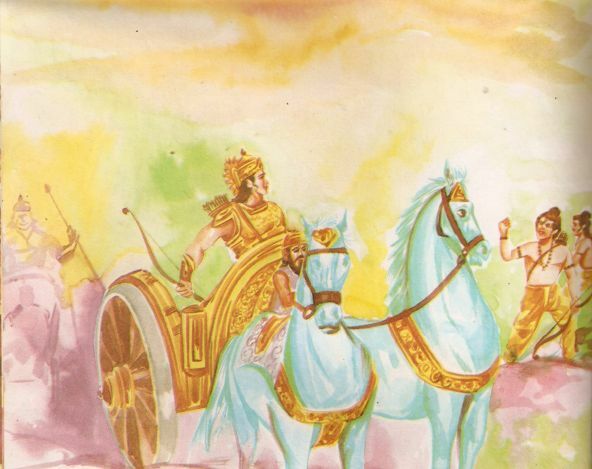 Rama marched to the battle-field at the head of his army in a chariot that moved with the speed of wind as if it were eager to come face to face with the enemy and to see all the tree princes of Ayodhya lying unconscious. 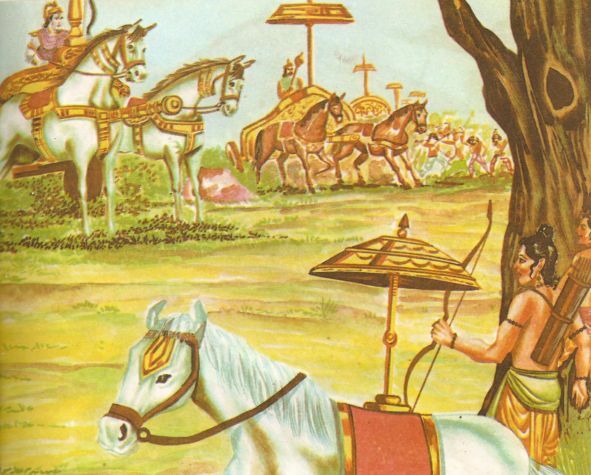 In due course of time, Rama reached the field of battle along with his army. Seeing the ruler of Ayodhya present in person there, Hanuman came running and stood before Rama with folded hands. 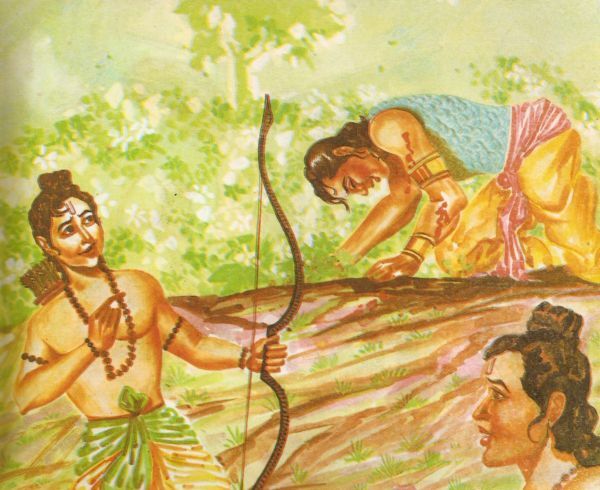 Hearing this, Rama was beside himself with rage and he lifted his bow and arrows. A fierce battle began. All the arouse shot by Lav and Kush were cut down mid-way by rama. But he himself did not shoot arrows on them. Seeing this, the twins were very surprised. 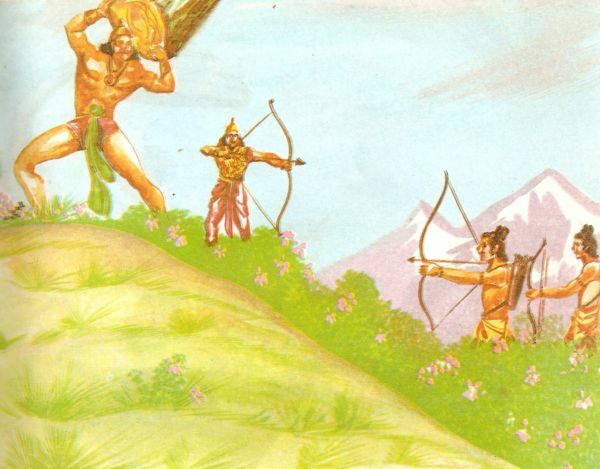 Still they continued the fight and kept showering arrow at Rama. 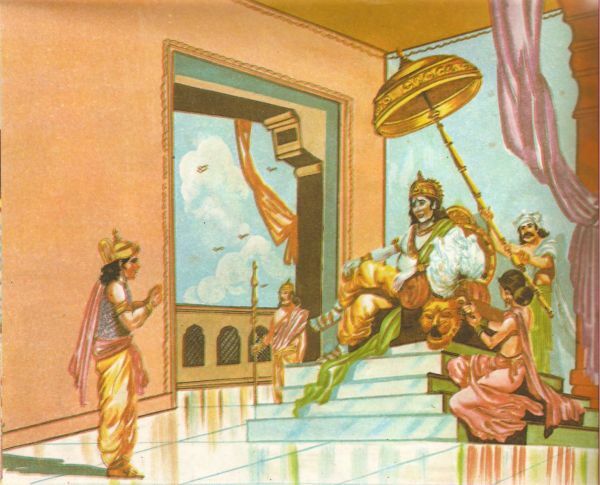 Rama, sitting in his chariot, kept rendering their arrows useless. His own soldiers were amazed to see him not attacking the boys. Seeing Rama not attacking the jungle-boys, Hanuman lost patience and he again jumped into the field of battle with his mace. “Let us take him to Vandevi, our mother. She will be much to happy to see him,” replied Lav. So, both the brothers carried Hanuman towards their hut. “A fine plaything! Where is it?” asked Vandevi doubtfully. “It is there outside. We’ll bring it here in no time.” Saying so, they brought hanuman and present him to their mother. Hearing these words, Vandevi trembled all over an she ordered her sons to untie the bonds of Hanuman. 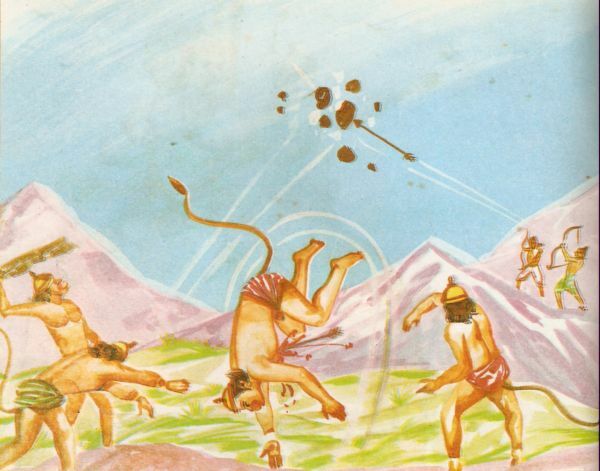 Seeing their mother in rage, they at once set Hanuman free and ran away from there. “I know everything, my daughter. But why do you worry? Everything will be all right in due course,” said the saint in a consoling voice. “How after all, father? These sons have proved to be a slur on the fair name of their dynasty,” said Vandevi in a faltering voice. “They have done no wrong at all, my daughter. Your worry is unfounded. They have done exactly what befits Kshatriya princes. They are sons of a great powerful king, who had freed the earth from demons and rescued you from the grips of Ravana,” said the saint in a consoling and sermonising tine. “He destroyed those who were unrighteous sinners and this brought laurels to his dynasty. But these children have killed their own men to bring disgrace to the great dynasty of Raghu,” replied Sita. Consoled at the saint’s words, Vandevi made for her hut along with Lav and Kush. “To flee the battle-field may be a principle with you. We are warriors. And warriors either defeat their enemies or fall fighting them with grace. They never choose to show their back in a battle.” Saying so, Lav and Kush started shooting arrow at Ram once again. 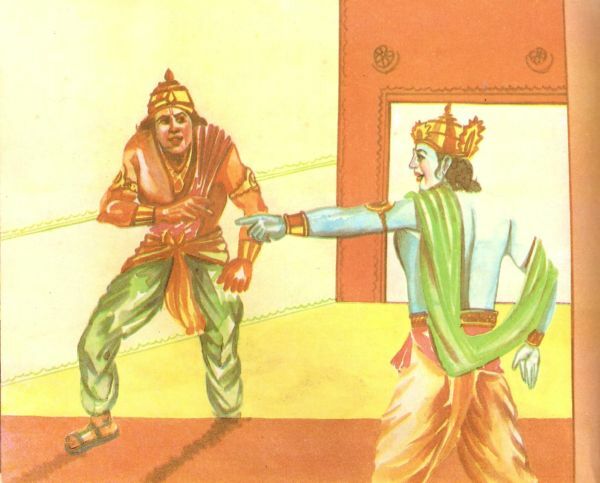 But Rama did not launch any counter-attack. He simply cut their arrows down mid-way and rendered them useless. 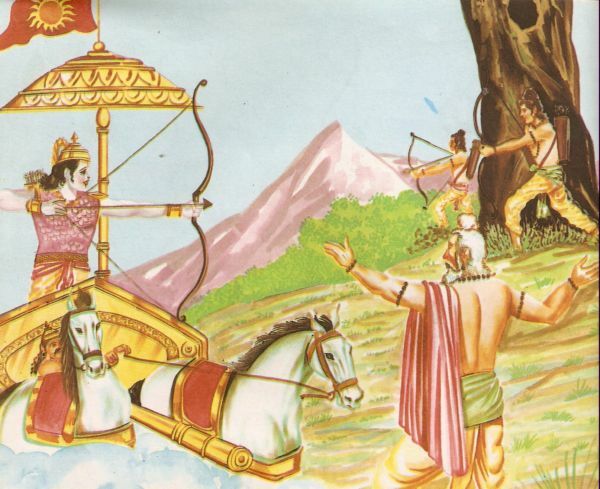 The battle went on for a long time when Rama lost patience and set his invincible arrow on his bow and said, “You are undoubtedly very rude and haughty, children! 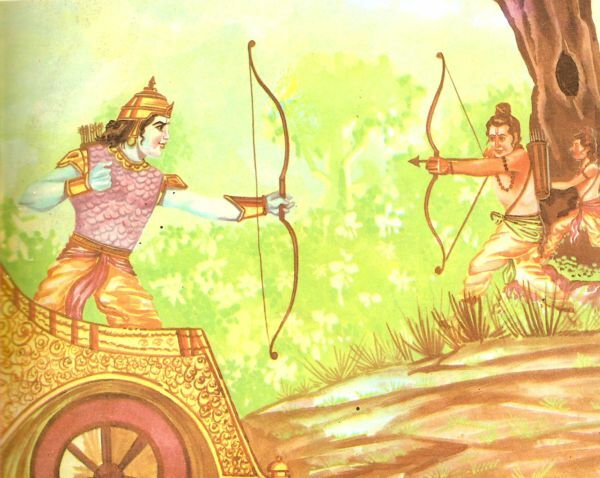 If God wants you to die of my arrows, what can I do?” Saying so, Rama drew the cord of his bow with a view to shooting the arrow. 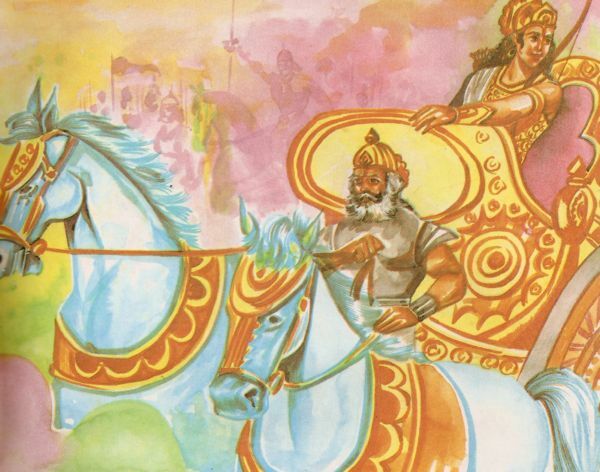 “Why after all, O Great Saint?” asked Rama in surprise getting down from his chariot. “What! They are my sons!” Rama asked as if he was ignorant of this fact. 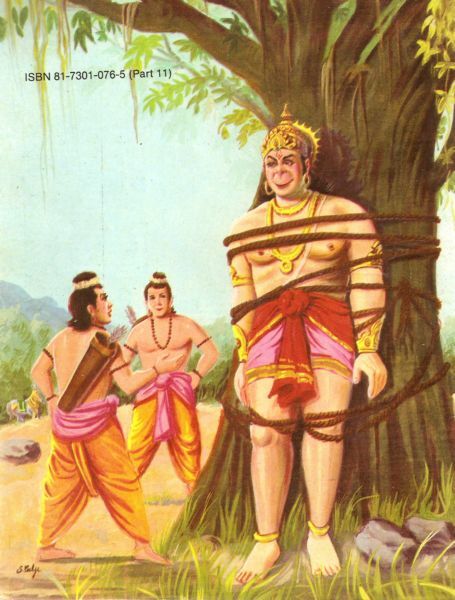 Directed by the saint, Lav and Kush bowed low before Rama and asked for his pardon. Rama uttered many blessings on them and hugged them most affectionately. They were overjoyed to have their powerful father before them. The meeting between the father and his sons rejoiced the saint and he sprinkled holy water on Bharat, Lakshmana and Shatrughna who were lying unconscious there. All the three got up and lay prostrate before the saint. 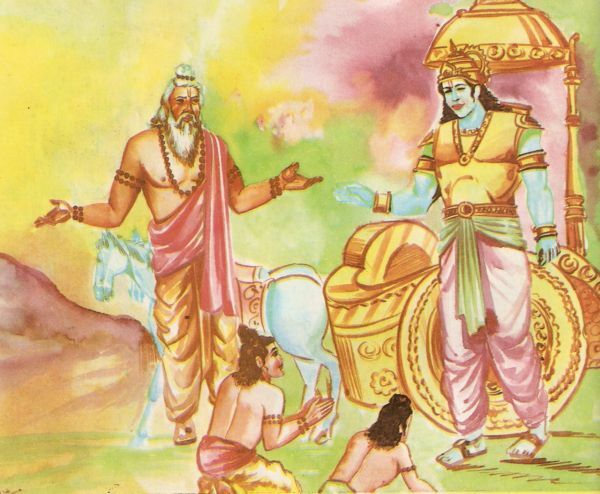 Then they turned to Rama and bowed low before him. 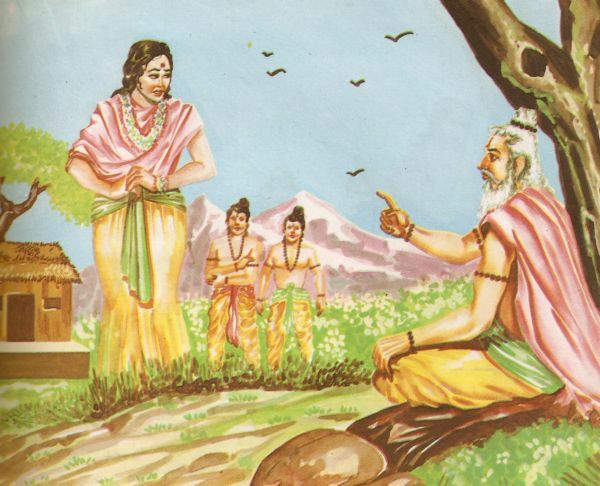 But they were amazed to se the twins in Rama’s lap. ... part 12 next week.